I found my new favorite snack food. 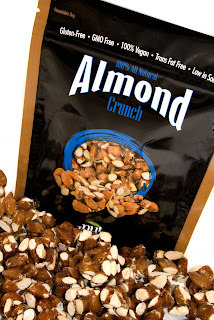 nutLand Foods, a manufacturer that specializes in health and wellness products, controls my midday hunger with its healthy, vitamin packed, nutritious Nut Crunch snacks. Each nut crunch blend is kettle-roasted in small batches to maintain the integrity and taste of the all-natural ingredients. The snacks are gluten-free, GMO free, 100% vegan, trans fat free and low in sodium, yet very full of flavor. There are six delicious flavors: Trail Mix Crunch, Cashew Crunch, Pecan Crunch, Pistachio Crunch, Almond Crunch and Berries & Cherries Crunch. My favorite is Almond Crunch. The dry roasted almonds are naturally sweetened with evaporated cane juice and mixed with sea salt, satisfying both my sweet and savory cravings. HOP INTO EASTER WITH LUSH! !